He has the sweetest job now — and he LOVES it. They were selling the wolf dog for drugs. Meth to be exact. They'd get at least a thousand dollars' worth - maybe more - for the sale of the wolf dog. 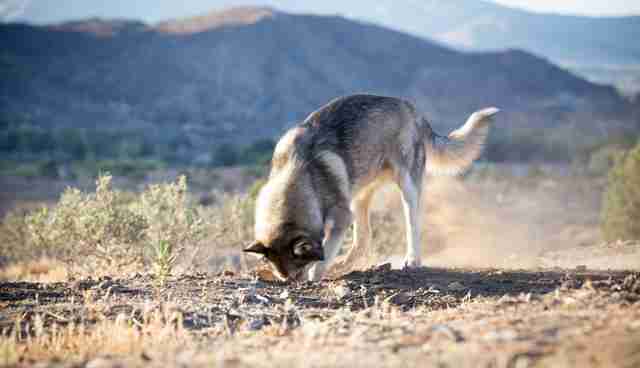 When police caught wind of the drug deal, undercover agents visited the San Bernardino, California, property where the wolf dog was being kept. Posing as meth buyers, the agents intercepted the exchange and confiscated the wolf dog, who'd been named Wolfee by his owners. Wolfee might have been saved from the drug deal, but he was potentially in more danger now. 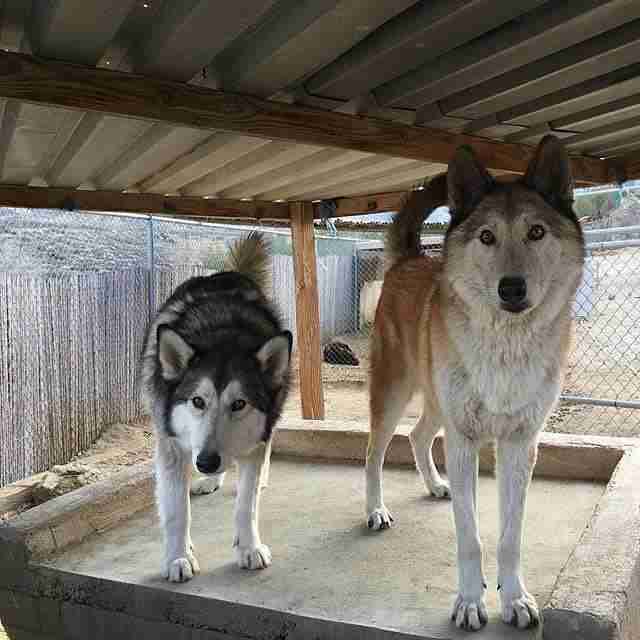 Wolf dogs are illegal in the Los Angeles area of California, and only certified wolf rescues can take them in, which limited Wolfee's rescue options. He couldn't be placed in a private home, and if sent to a shelter, he'd be euthanized within 72 hours. 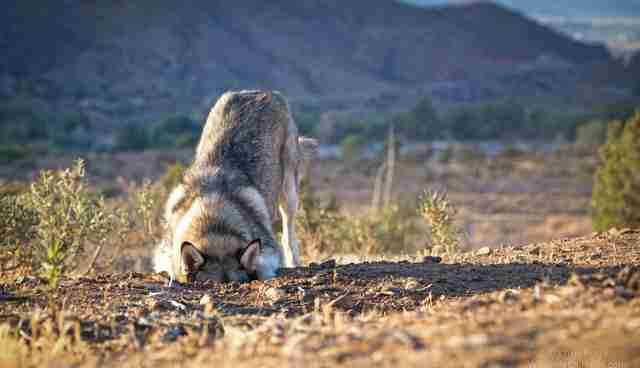 The ironic part of it was, Wolfee was more dog than wolf - he was what you'd call "low content" wolf dog. 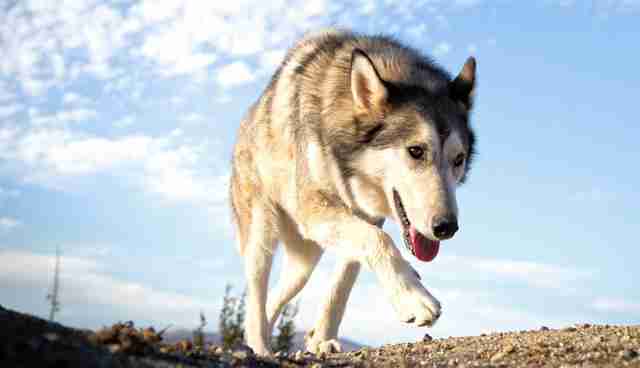 Wolfee's owners had labeled him as a wolf dog to make him more valuable, but this had jeopardized Wolfee's safety. 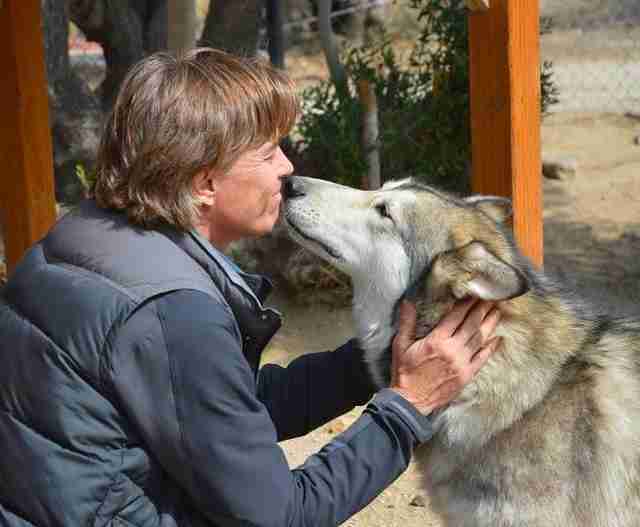 Thankfully for Wolfee, a licensed Californian wolf refuge, Wolf Mountain Sanctuary, was able to immediately take Wolfee into its care, which saved his life. 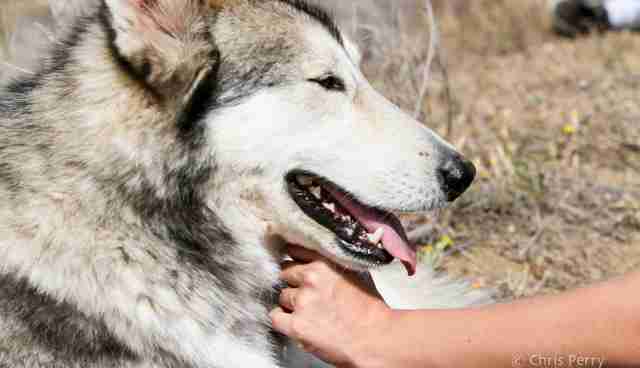 But Wolf Mountain Sanctuary only kept pure wolves at the sanctuary (which Wolfee was not), so it reached out to Wolf Connection, a wolf dog rescue center and sanctuary that runs a youth education and empowerment program in California. Wolfee was only 8 months old when he arrived at Wolf Connection. He seemed to be in good physical shape, but when the medical team did a routine health check-up, which included an X-ray, they discovered something shocking. "He had BBs lodged in his body," Renee Alfero of Wolf Connection tells The Dodo. "The most likely reason was that someone shot at him, maybe for target practice." 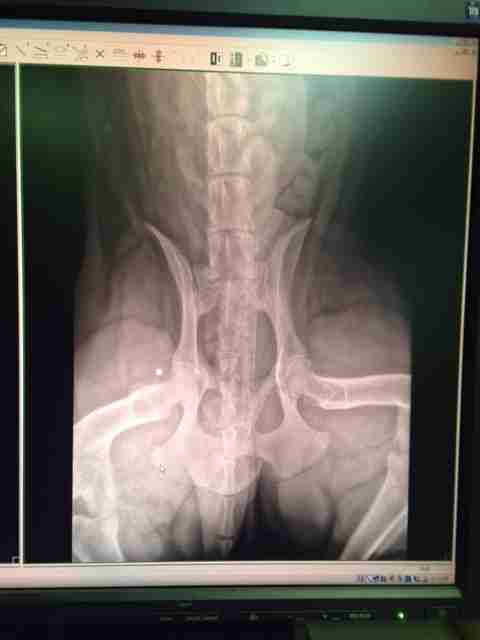 The X-ray revealed three BB pellets lodged inside Wolfee's hip, but the medical team suspected there were more inside of him. They weren't able to remove the BBs without putting Wolfee's life at risk. "Health-wise he's perfectly fine as a healthy young pup," says Catherine Salansky of Wolf Connection, "but we notice that when he sits, he sits back on his haunches, possibly due to the BB placement. He doesn't demonstrate pain in sitting or avoid it, just has a different position." 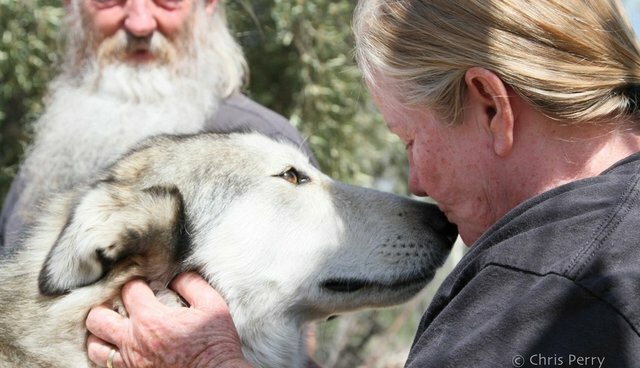 Despite everything Wolfee had been through, he was surprisingly and friendly and affectionate when he arrived at Wolf Connection. 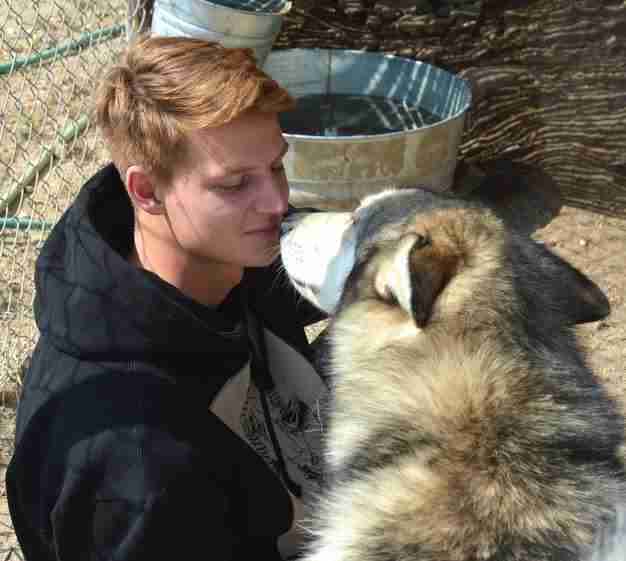 "When I first met Wolfee, he seemed so happy and excited for the fresh start," says Alfero. 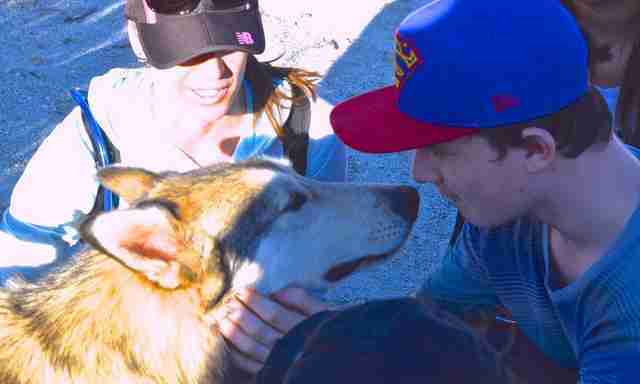 "Wolfee loved greeting his new human pack and the other male wolf dogs, who we call the 'kindergartners.'" Wolfee adjusted so well to his new home, Alfero decided to include him in a hike for young adults recovering from substance abuse. Wolfee's calm and gentle demeanour led Wolfee to become a permanent fixture in the recovery group - in fact, the participants started referring to themselves as "Team Wolfee." "Wolfee has no hesitancy in meeting new people and will gaze into the eyes of everyone he meets," says Salansky. "After being exposed to Wolfee's loving nature, participants are usually shocked to find out that Wolfee was actually abused by his owners." Besides helping with the substance abuse programs, Wolfee participates in Wolf Connection's 8-week youth empowerment programs and monthly community awareness hikes, as well as private sessions for individuals and families. When he's off duty, Wolfee likes to dig holes, chase lizards, play with the kindergarteners and stare lovingly into the eyes of his caretakers. "Our pride in Wolfee's care at Wolf Connection is the same for all of our animals," says Alfero. "We love each of them and we're proud to give them the highest quality of care, an incredibly enriching life and recovery from the trauma that they experienced prior to coming to us." To help wolf dogs like Wolfee and to support Wolf Connection's youth empowerment programs, you can donate here. If you'd like to meet the Wolf Connection pack yourself, you can contact them to schedule a visit.